If you have any questions or want to enquire about dates, use our form to contact Elena Scalambrin or see their website for more information. 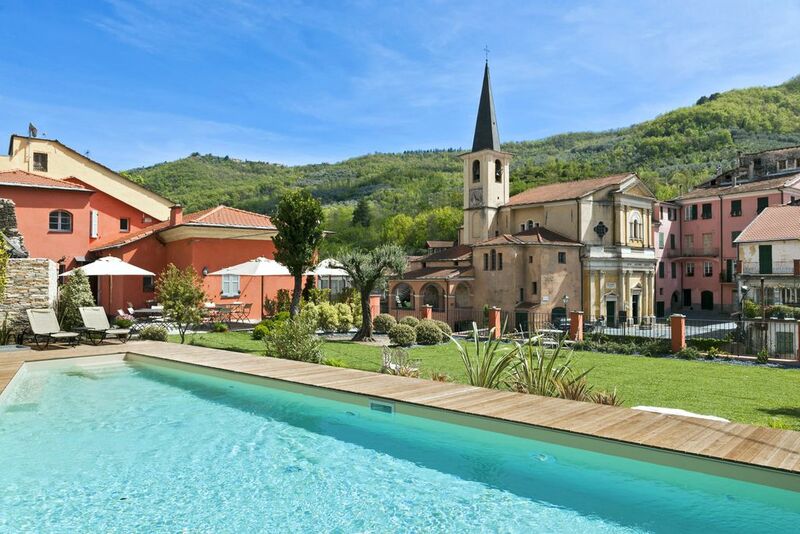 A superb hotel spread across three old buildings in the sleepy Ligurian village of Borgomaro. Delightful Elena and her family have converted a 19th-century butcher’s shop, her grandparents’ home and a 14th-century stone house into a stylish ‘Albergo Diffuso’. Life is wonderfully slow here; church bells mark time and only ducks quacking in the river disturb the silence. You check in at Casa Madre, where there’s a cosy library for afternoon tea, a garden planted with rambling roses and fragrant jasmine, and an irresistible pool. Impressive breakfast spreads featuring biscotti, cured meat and focaccia are served here too – you can even start the day with a glass of prosecco! Bedrooms in this traditional, double-fronted house are light and airy; some overlook the garden and village square. Wander across the river to Casa del Borgo where you can sleep in elegant rooms with vaulted ceilings; room 12 has a luxurious roll-top bath. Casa del Fienile, 40 metres away, has two atmospheric bedrooms furnished with antiques including a wardrobe from Elena’s grandmother’s dowry. Borrow thoughtful guides to local walks and beaches. 29 October - 22 March. Extra bed/sofabed €20-€35 per person per night. Have you visited Relais del Maro? Be the first to leave a review. Borgomaro is a little town with 300 inhabitants: it’s the perfect place for peace and quiet only 15km from the western Ligurian coast. Imperia’s beaches are only 15km away – choose between sand or shingle! For those who love immersing themselves in nature, there are walks right from the town, and a short drive away, where you can see panoramic views over mountains, coast and olive tree groves. About an hour away are the famous towns of Alassio and Sanremo, perfect for shopping-lovers and with a more urban atmosphere. The Côte d'Azur, with Monte Carlo and Nice, is a short drive away, for those who fancy a taste of France. And for wine lovers, you can reach the Langhe region in about an hour and a half.